CSR of KDS - An inseparable bond. . . . Since inception, KDS has been always sensitive towards its surrounding communities. Social responsibility hence became synonymous with the KDS brand. Our LIVE GREEN philosophy started long before in our minds before it was officially integrated into the corporate policies of the various business divisions. Although rather silently, KDS has always sponsored many charitable causes for the betterment of the people, region and the greater community. The visionary business icon of the country, Al-Haj Kalilur Rahman, Chairman of KDS Group has always accepted by the extended community and industry peers as a man of resolute compassion to stand side by side with worthwhile charitable initiatives such as poverty alleviation, education, women empowerment, emergency relief, etc. We have not only been sensitive to the needs and comfort of all our staff members at all levels, we also actively endeavor to safeguard our living environment. We have continuously undertaken many initiatives to ensure that we make a difference towards a cleaner and greener tomorrow. The 2011 initiative . . . . The most recent major initiative of KDS is titled SAFE DRINKING WATER. During the span of 2010 - 2011 we have tried to raise the awareness levels of this acute crisis of Safe Drinking Water through its corporate communication materials. This was applauded by all KDS stakeholders in both national and international context. 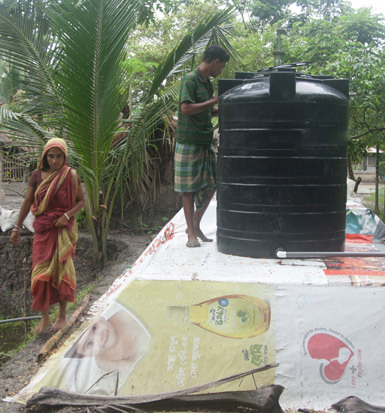 Inspired by the response, KDSAL has been active to research and identify regions in Bangladesh where many communities are suffering due to access to Safe Drinking Water. At KDS, we have committed the 2011 CSR initiatives to provide arsenic free drinking water to at least 100,000 people of Bangladesh. It becomes the right for those privileged to reach out to those who are less fortunate. It is about being human.